Looking to get more involved with the park this season? 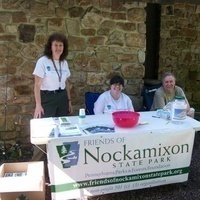 You're invited to join our amazing group of volunteers - the Friends of Nockamixon State Park! There's no better way to be actively involved, give back to the park we all love, and make a great set of friends at the same time! Join us on April 8, from 6:30-8pm at the Education Center to meet some of the Friends and learn about projects the Friends are working on and how you can help. Bring a flashlight to find your way back to your vehicle after the meeting. 1. From the park office parking lot, take a left into the park entrance and follow the main park road into the main day use area. 3. Proceed approximately 0.3 miles to the parking lot and park on the lowest section of the parking lot, immediately in front of you. 4. Walk to the steps leading down to the playground, in the farthest corner of the parking lot. 5. Follow the paved path to the left, past the bathrooms, to the Environmental Education Center. For persons with mobility issues or those that require ADA access, please contact the park office to arrange accomodations.